I confess feeling sick in the stomach when I read this kind of news in the newspapers . According to Rodrigo Mattos, in his blog at UOL Sports, the temporary structures of the 3 largest stadia – Mineirão ( Belo Horizonte ) , Maracanã ( Rio de Janeiro ) and Itaquerão ( São Paulo ) will be ready only days before the opening of the World Cup . This, therefore, means that there will not be any test event. This finding would be sad if it weren’t so serious. Testing events , FIFA’s requirement and of any other sensible person , serve exactly for what they are called: test structures, site functionality, security complex, communications, the ease of movement and emergency evacuation . I can only presume that they will be tested by the ‘ guinea pigs ‘ who shelled out a fortune for the ‘privilege’ of watching a game during the biggest sporting event on the planet . And the thousands of foreign journalists who will be there trying to file their stories. Talk about shooting yourself in the foot! Obviously, if those are the biggest venues they are also those which will require the largest temporary structures . In São Paulo , host of the opening match between Brazil vs Croatia on 12th June, they don’t even know who will pay for them. In Rio and Minas , governments are preparing to start looking for companies to hire. In Beira Rio, Porto Alegre and Brasilia, the process of looking for companies to hire has started but no contract has been signed. The truth is that none of the 12 venues fulfill the schedule stipulated by FIFA which included these works were to be started in March! The more I write the more my stomach hurts. 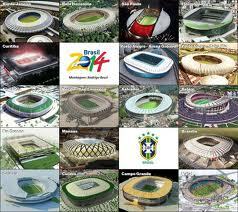 In the Amazon Arena , the State Department reported that , with the completed bid , the intention is to finish it in June. In Castelão , the deadline of government of Ceará is also June 6th. The state government of Rio Grande do Norte provides for late May the realization of structures , which will be installed on April 20 . But the bidding for procurement is still in progress . The installations have started only in two stages : at the Arena da Baixada and Pernambuco Arena . Mato Grosso has also completed the hiring company responsible for additional Arena Pantanal . The provisional budget for all this equipment is estimated to cost £92,5 million . But experience tells us that it will mos likely increase.